KAFLAB is a foundation dedicated to re-define Arab identity through design. Starting from the initial question of ‘What Arab is’, Kaflab looks to analyze the elements, symbols and icons that truly define this rich culture. Kaflab is inspired by its initial project, al-Kafiye, which we believe is the strongest symbol to come out of the Arab world. Because Arab identity is muddled from the outside by Western influence, stereotypes and projection; and from the inside by Islam and national differences, it is vital for us to act now. By applying design thinking (deconstructing then reconstructing) to Arab identity, we hope to open up creative minds and provide them with a platform for expression free from religion, hopefully to match if not change eminent negative stereotypes. It’s time for change. What is the Al Kafiye Project? 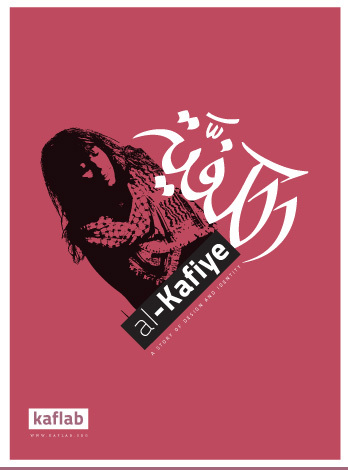 The Kafiye is the strongest symbol to come out of the Arab contemporary world. The story of this powerful symbol, accessory and design detail has played many parts in diverse phases and keeps adapting with globalization and time. Using the Kafiye as a platform for change, we would like to open up new angles on Arab identity and provide stronger design tools for future generations. Al-Kafiye project is educational and inspirational - By bringing together designers and thinkers to lay down foundations for Arab identity, we can offer generations to come a new path to uncover. A group of exceptional Arab visual artists and designers have been invited to participate in an exhibition in New York about the Kafiye. Each one will interpret an angle of the discussion according to their unique creative vision. One more participant will join the show through an open call for entry. The exhibition will be part of a bigger event/symposium and book launch on the same subject. Hala A.Malak is a design critic, writer, curator, branding consultant and Middle East expert who has her own particular view of the world. She heads her own consulting firm, The Design Critic - www.thedesigncritic.com and currently resides between Beirut and New York. Tarek Atrissi runs a leading Netherlands-based design studio, Tarek Atrissi Design, specializing in Arabic design, branding and typography - www.atrissi.com. He has received the Adobe Design Achievement Award and the Type Directors Club's award for typographic excellence. He is also the founder of www.arabictypography.com.